Harman/Kardon, as the largest American audio manufacturer, hardly requires special introduction. Its founders, Dr Sidney Harman and Bernard Kardon pioneered the audio industry, along with such great men as Saul Marantz, Paul Klipsch, James B. Lansing and so forth. Today, Harman International actually owns many famous audio names throughout the world, such as JBL, Infinity, Madrigal Labs, Mark Levinson, Proceed, dBX, Studer, AKG, etc. In its time, H/K enlisted the services of the legendary prof. Matti Otala, an audio legend in his own right, who further enlarged on his and H/K's theories of wide bandwidth, low feedback design, and large current capacity with Richard Miller, head of H/K's design. This model is in many ways a good representative of what H/K really does. It is an integrated amplifier delivering nominally 85/130W per channel, into 8/4 Ohms, 20 Hz to 20 kHz with no more than 0,08/0,3% of distortion. Using IHF tone bursts, it will deliver 110/170/240W into 8/4/2 Ohms. High Instantaneous Current Capability (HCC) is rated at no less than +/- 70 Amperes - but I must point out that this is far too vague, as it says nothing on how long is "instantaneous", and how much distortion is generated along the way. But more of this later. S/N ratio for all inputs is rated at -100 dBA, frequency response at 1W/8 Ohms as 0.25Hz...150kHz -3dB, and the half power bandwidth is rated as <10...>100,000 Hz. The damping factor into 8 Ohms is claimed to be better than 100:1 (presumably into 8 Ohms), while overall negative feedback is said to be just 10 dB (3:1). Its vital statistics are 443x134x406mm (WxHxD), and it weighs in at a healthy 12.4 kilos (app. 26 lbs). It will use up some 300W from your wall socket. On the front panel, made of aluminium and painted black, you'll find (from left to right): stand-by/power on switch, a headphones receptacle, pushbutton switches for speaker pairs (A, B, or A+B), remote control sensor, seven double rocker switches (upper row with green LEDs indicating source, lower row with red LEDs indicating Rec Out), bass, treble and balance potentiometers, a Tone Defeat switch, a Mono switch and lastly, the large volume pot, with a green, illuminated marker. On the back, you'll find all the required RCA Cinch connectors, none of which is gold plated (odd for a unit of this price class). The speaker binding posts are hefty beasts, capable of receiving cables in the 5mm class - good show. You'll also find small connectors for linking the amp with other H/K units so all may be controlled by the same remote, and a blanked-out space. That's intended for possible installment of the optional post-market phono RIAA board, should you choose to install one. The remote control is an unusually well laid out unit, with easy to see and easy to use buttons of reasonable size and quality. For the technicalities, please see "Tech Corner" at the end of the text. As this unit was taken brand new out of its box, I let it play continuously for four days before I sat down for some serious listening. I combined this with equally new B&W DM601 S2 speakers, which also needed running in. It didn't take me long to discover that the 680 needs about an hour to reach its normal operating temperature. It will produce some heart-warming heat after that time, not much, but just enough to let you know it has been healthily biased. Bear in mind this time required to prime it before evaluating it. Notwithstanding its specifications, I tried my usual test by swithing off all sources on their respective boxes, selecting CD, defeating tone controls and cranking the volume up all the way. Then I all but put my ear against the speaker tweeter, listening for any noise I might hear. To be sure, at full blast, some noise is there, but it is totally insignificant in comparison with what you would be hearing if any programme was present. Thus, for all practical purposes, this unit is very quiet indeed and will do justice to quality ancilliaries. My most important aspect. I played some Hevia, then some Ramazzotti, followed by some hits from the sixties and seventies, finishing with Vivaldi's "Four Seasons". Well folks, it's all there, every little bit of it - and it sounds good. I can't say I haven't heard better at all, but at this price, I really haven't. Since the Wazoo was still with me, I used the opportunity to compare them head-to-head. Yes, the Wazoo was slightly better in the higher range, not significantly so and certainly out of proportion to the price difference. However, on the bass lines, the Wazoo has some way to go before it catches up with the H/K. The 680 gave me smooth, easy flowing music, yet still with that added touch H/K has always been known for and was always great in, the bold, vivacious bass, which is not overblown, but is powerful and convincing. This boy has all the speed, the urgency it needs, but is dressed strictly in a designer suit. This isn't power running wild, it's power under control - it can be quiet and almost unseen, yet can pounce on you the first time that's required. It has an air of ease, it makes you believe there's nothing it cannot do, and do it right, no compression here, thank you. My JBL Ti600s were really singing with this one, but more to the point, my AR94s have waited a long time for this kind of drive. They are difficult to drive speakers and despite their excellent sound, sometimes really tax lesser amps. However, not so with the H/K - if anything, the H/K tripped them up in the sense that they were really sweating while the H/K seemed easy - a little hotheaded, but still an easy rider. The small, budget speaker reference, JBL CM62s, sounded just as good as with the Wazoo - however, they are the weak link here, and in fact prevent both amps from showing all they are capable of. A price mismatch, if anything. Yet, with all those speakers, what the 680 managed to do, with the expected difference stemming from difference in the speakers themselves, was to produce a wide sound stage, with very good depth beside excellent width. I look for these qualities, as they are so frequently missing from the lo- and mid fi. I have always thought of H/K as a company producing amps which without fail sound more, sometimes much more powerful than they notionally are; so far, they have managed to maintain that tradion, and then some. However, H/K's fortunes were mixed in terms of the quality of those undisputedly very loud sounds; while very, even extremely, load tolerant, their amps were a mixed bag over the years. Sometimes they weren't much to speak of (e.g. HK 640), sometimes they were good (eg. HK 6550), and sometimes, even very good. Well, the 680 is in the very good class. Play it loud and it appears never to run out of steam - subjective, of course, as every amp will eventually run out of steam. It's just that in this case, by the time that happens, and depending on your speakers, you may well be stone deaf from the loudness, dead at the hands of unfriendly neighbours with little respect for your decibel craving, or in total nirvana by the time the 680 decides it's time to quit. But don't expect this one to start blurring things and dropping details en route - not tonight, Jose. No, the H/K 680 pulls the same trick as the Wazoo - it managed to maintain its sonic character despite the abnormal volumes I required of it. And that includes the AR94s, which did manage to make the 680 go from warm to hot, but not too much so. Only when you approach its absolute limits, by which time, I hasten to add, my windows surely and I think my walls as well must have been shaking, only then will it start to change its tonality. But man, the drums on Hevia - I don't have the fortune to hear them that convincingly so often, with so much power it makes me want to cry. Unlike some other models, the 680 has a clean, clear and very focused midrange, coupled with a sweet treble I haven't heard too many solid state units in this price range deliver. The clash of cymbals, for example, has a very good, very convincing tonality, with first class decay time and complete absence of typical transistor nasties. It would, I think, be at home with considerably more expensive gear. Rise times, in case of H/K's ultra wide badnwidth concept, are taken for granted, as they should be. Another very nice surprise was the amount of details available - its resolution powers are well above the average in its price class, and coming very near those well above its price class. It's not quite the Wazoo, but it's dangerously close. An odd quirk happened here. My Harman/Kardon HD730 CD player uses a discrete, all-transistor, no IC output stage (one of the reasons why I bought it). It has uncommonly good bass lines and sounds more substantial than most CD players in its class. On the other hand, it has a somewhat dark tonal picture. My rebuilt Philips CD 721 player, on the other hand, uses an Analog Devices AD826 IC for line output. This is a very fast chip, fast to the tune of 350V/uS, and with a top class settling time of just 70 nS. Now, some pieces of music played via the H/K HD 730 sounded a little slower in comparison with Philips, and even more surprising, the Philips provided a slightly greater level of details, those very fine nuances usually lost, than the H/K, which costs some 2.2 times the price. Nothing like this has ever happened to me before. To add insult to injury, the 730 was linked to the amp via a pair of half metre van den Hul cables with Neutrik phono plugs, while the Philips still uses its original, factory installed, tinier-than-a-human-hair captive cable with those nightmarish plastic horrors of cinch plugs. The morale of this incident is that the 680 is fast, very fast, and likes fast ancilliaries, obviously preferring them to more sedate sources. So, if the 680 doesn't sound impressive, be sure to check out different sources, as it may well turn out that it is in fact bogged down by upstream electronics. It's not that it DEMANDS fast, it's just that it can get the best out of fast, but also possibly not sound at its own best with slower components upstream. After all, you wouldn't want to put bicycle tires on a Ferrari, would you? The Harman/Kardon 680 has all the usual company qualities and misses out on most companies' nasties. Its bass lines are superbly deep, powerful and gutsy yet controlled, and I quite seriously challange any and all comers within its price class to try to equal this (the only serious contender I can think of is NAD's new 317, which while good, is not quite in this class). But this speed, rhythm and power has long been H/K's strong side, so I regard this merely as natural evolution. Its midrange is the best I have heard to date from this company's integrated units, and one of the best in its price class. It's all there, and I'm hard pressed to say anything in form of critcism for fear of being either unreasonable, or less than truthful. Let's just say it's very, very good, period. Its high range is much better than what H/K usually offers, insofar that it retains all the speed and absolute clarity known from earlier models, but with much more finesse than before, or lower down the product line. Music does not spit, is not harsh or unruly, and in fact, it strongly reminds me in overall qualities of some considerably more expensive integrateds. I can't vouch for it, but I believe that negative feedback has a way of ruining the high range - don't use overall feedback and you usually have good high range, but the bass lines suffer (re: Thule Audio, Electrocompaniet, Wazoo, ...). So it's always a matter of compromise, and it seems this is where H/K got it exactly right with this model - just enough to control the bass, yet little enough not to ruin the high range. This is a smooth, powerful performer, capable of whisper quiet playing and a thunderbolt out of the blue if necessarry. It reminds me of a panther, being capable of stalking you and pouncing at you the instant that's required, with much grace, finesse and that exclusively cat-like speed. Then again, until some months ago, this was their best offering. It will portray anything from Vivaldi to Peter, Paul and Mary, to Led Zeppelin, to Guns'n'Roses with equal finesse, always fleet of foot, always powerful appearently over its nominal capabilities, yet always in control. Its sound stage is unusually good, which I believe is a function of its dual mono design - but whatever, it's really good. Not as wide front-to-back as with the Wazoo, for example, but very good for its price class and dangerously approaching the Wazoo. Its deep down bass lines will be a revelation for many a mortal this side of Krell, Levinson et al. I couldn't help comparing it with my resident commercial unit reference, my trusty Yamaha AX592. The Yamaha is formally somewhat more powerful, being rated at 100W/8 Ohms, but more important, it is rated at 290W/2 Ohms, indicating it should be even more load tolerant than the H/K. Nothing of the sort happens in real life. Sure, the Yamaha will play loud, but it has performance fall-offs on both ends. It's treble, while not offensive or harsh, is nothing like the 680 - the 680 has much more finesse, more smoothness, but without undue rounding-off. It maintains its sting and bite, but will, I believe, sound the pants off Yamaha any time, any day, any system. And that's for what H/K is not famous for - just wait for what it is famous for. The midrange lines on both amps, while of somwhat different color of sound, are good, even very good. But the bass lines on the H/K are to die for, and the Yamaha was simply lost there. Not that it lacks bass, it doesn't, but the quality of delivered sound is very far removed from the H/K. The Yamaha will dish out, but you'll be aware that you're listening to a recorded performance all the time, while the 680 can, if you're willing to close your eyes and let go, make you believe that the drummer is just in the next room. For believing he's in your room, you'll need to dish out substantially more pieces of silver. However, I must add that by local prices, the H/K is exactly twice as expensive as the Yamaha; looking at it from that point of view, both amps deliver, and both could be called great deals, it's just that for more money, this time round, you really get more - and even much more - performance. As you are probably aware, this equation does not always hold true. This is a very competently designed and executed unit, which clearly stands above its immediate competiton, and in my view, comes dangerously close to products above its price class. It uses some classy parts and ideas inside to achieve a very distant goal - to make the mixture of all that greater than the simple sum. All want to do it, few succeed. H/K succeeded to a fair extent with this one. In realistic comparisons with similarly specified units below and slightly above its price point, I believe it will come out on top, perhaps sharing the first place, sometimes with a small, but much more often with a not-so-small-margin in its favor. It is a very well composed unit, with very good sound staging and with supremely deep and clean bass lines, while not overlooking anything - in fact, it's a seamless unit from top to bottom. Its resolving powers are very good indeed, and you won't miss many details, if any. Depending on what you currently have, you may well discover many new details you never knew were there. Frankly, I was somewhat taken by surprise over this, as I'm not used to hearing so much clear detail at this price point from commercial products (i.e. excluding small, specialist companies). No doubt some purists will balk at the tone controls - the 680 doesn't really need them, and it does have a defeat switch, but I suppose that was a concession to the general market. Others will complain about the mono switch - I support its inclusion on grounds of sanity. Stereo is most sensitive to channel balance, and speakers work under ideally similar conditions only in textbooks. In real life, one needs to adjust the balance for reasons of room acoustics, positioning and so forth, and there's no more accurate way I know of than to do it at the sound signal's last stop before the speakers. So, long live the mono switch! At TNT-Audio, we don't have "Best Buy" or "Recommended" tags, just as we don't have paid ads. Therefore, please take the following comment as my simply reporting on the chain of events - while this started as a simple audition of a unit from a reputable source, it ended up with my returning not the unit, but the money for it. My venerable H/K 6550 was in some need of replacement, and while I'd be eager to use my own amps, they are not commercial units and cannot be duplicated in your home (their would-be commercial price being a significant factor if you're single, and crucial if you're married); therefore, to give my comments some real meaning, I am obliged to use something any reader can also obtain (finances and She-Who-Must-Be-Obeyed permitting) and I am not allowed to tinker with it (well, you can't win 'em all, can you? And I so wanted to drop in a really big toroid, ...). Since I'm writing this, obviously my good wife has decided to keep me for a while longer, despite my affliction with audio, so you can take this as a sure sign that even the price is all right. In short, what we have here is real world power considerably above the norm for its class, coupled with true finesse. It may not be High End, but it surely is an audophile product if I ever heard one - and at a still reasonable price too. What more can you ask for? My curiosity got the better of me, so I took the 680 to a friend's house. He has a pair of Apogees, which I consider to be such a difficult load that they might as well be nicknamed "The Budget Amp Killers". 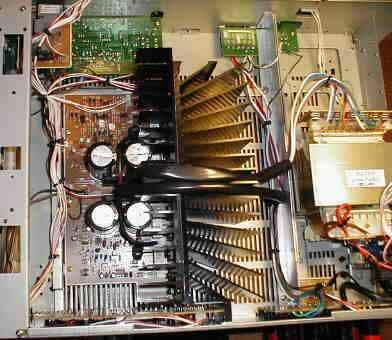 He uses a custom built 200W per side amp, using 6 pairs of 250W Motorola power transitors per channel. And the room is kinda big, at some 5x8m (app. 16x27ft). Well, we laid on some fast and powerful stuff, like Vangelis and Enigma, but also some acoustic, gentler stuff, like Kitaro and my inevitable Vivaldi. Berlioz and Mozart did some time too. Rather to my surprise, the H/K 680 managed fairly high levels of loudness before it became stressed and started really heating up. The Apogees it drove actually dip down to 2.1 Ohms with a significant phase shift, all of which has the amp see something like 1.1 Ohm "impedance" (hell, that's more like a short circuit than an impedance - you might as well drive your solder gun with it). If kept within reasonable room levels, the H/K had no particular problems with those speakers. As was to be expected, some of its transients weren't what they should have been, even if only in some extreme cases. However, just as with JBL CM62s, we have here a gross price mismatch, only in the opposite direction. Not many will drive $ 8,000 speakers by a $750 integrated. 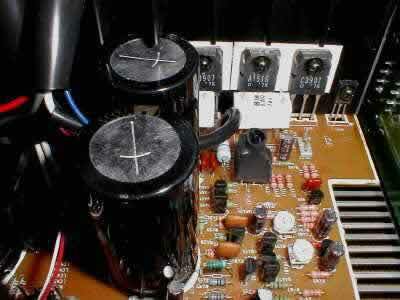 Then again, not many $750 integrateds will drive those speakers at all; try it sometime, but have spare fuses ready. And don't forget to pray. Inside the HK 680, you have an opportunity to see some serious thinking. Starting from the customary H/K weakness, junk potentiometers, I was pleasantly surprised to find what looks like an Alps motorized unit for volume; the others I couldn't see, as they are covered by a printed circuit board. The power transformer is a healthy looking unit, with no markings indicating its rating - as an estimate, I'd say it's good for about 450-550VA. It also appears to have dual secondaries, as its outputs are fed to two separate bridge rectifiers of substantial capacity. They in turn feed two Elna for Audio Series Black capacitors per channel, each rated at 8,200uF/63V, for a total of 32,800 uF. While not exceptional, this is in fact rather good, as each channel has its own power supply, with no influence over the other channel, so this is always good news for low crosstalk. I like dual mono designs. The power amplifiers are elaborate affairs, offering evidence of clear thinking and good parts selection - there are close tolerance 1% metal film resistors in evidence, as well as other quality components. I must say, the outlay is better than H/K had before, compact, neat and appearently well studied, lending credibility to the sales blurb of "improved layout" (on occasion, the Holy Marketing Man speaketh the truth). The actual channel output stage uses two pairs of 2SC3907/2SA1516 transistors (180V, 12A, 130W, 30 MHz), quite sufficient for its rated power. H/K says they are connected in a "triple Darlington configuration", which means they have local feedback applied for low distortion. This enables H/K to use only 10dB (3:1) of overall feedback, a value I (from my own designing experience) consider to be ideal, just enough to control those bass driver cones, but low enough for the amp not to depend on it for critical performance (i.e. its open loop response obviously exceeds hearing threshold). The cooling fans are also somewhat unusual. The designers used an anodised aluminium, half plain, half finned cooler, this one turned towards the electronics. It is flat on the back side, the one towards the power transformer, and upon that flat side, they attached another heatsink with very big fins at all angles. The two are joined and held together by screws, and silicon paste has been liberally used to thermally couple them as well as possible. The end product is a very efficient heatsink. An unusual approach, but evidently effective. All this was not done for the sport of it. Give it an hour and the HK 680 will become very comfortably warm, not hot, but nicely, reassuringly warm. This indicates higher than usual quiescent currents, meaning that the amp is biased towards class A more than is customary. That's good news for the sound and class B crossover distortion, which is thus decreased. The input switching stage is also unusual. Instead if using ever so popular (and in my view, poor quality) CMOS switches, and eschewing classic relays (in vacuum, with gold plated contacts, or if Thorsten has his way, in mercury dipped contacts) in favor of FETs. Theoretically, FETs are ideal switches, but they tend to produce large unwanted spikes upon switching on, which is why most manufacturers don't use them (too much work, not worth it). H/K seems to be of different opinion, and I can attest to the fact that there is absolutely nothing by way of unwanted noises while switching (offhand, I'd guess they use some form of temporary muting). However, making use of this concept allows H/K to perform actual switching on the input board itself, thus eliminating long selector shafts, dirty contacts, grit and grime which inevitably collect sooner or later on any but solid state contacts, and of course, any undue wiring. In addition, even those printed circuit board runs can be kept very short - and in fact, they are kept very short. Excellent work, this. However, there's still the wiring from the board to the speaker selector switches to the binding posts - I never liked that arrangement, and still don't. About the only nice thing I have to say about it is that provides room for brother tweakers to their best or worst. All circuits are said to be made using discrete technology, and indeed, I saw no integrated circuits inside (notwitsanding their probable use for the infrared remote control function, but that has nothing to do with the program signal). Some rough measurements indicated that it is in fact MUCH more powerful than the declaration would have you believe. It delivered 10mS bursts of - hold on, now!- no less than 430W into 2 Ohms. Good God, that's almost double of what the rating specifies! Also, those are bursts of some 21 Amperes, something not many can boast, and in this price class, very few indeed. Better yet, it pumped out just over 680W into 1 Ohm - now, that's one Mean Machine, as those are peak current outputs of almost 37 Amperes. No wonder it drove the Apogees so well. And it remained completely stable. What's to say with results like this? It's been a long, very long time since I came across such a conservatively specified unit I almost forgot what it looks like. It's really underspecified, but what the hell, that's great news for the owner. Nevertheless, I would urge owners to be very prudent with that volume control - that kind of power means it's imprevious to almost anything one cares to call a speaker, which is good, but is also quite capable of destroying lesser speakers if pushed hard, which could be dangerous. However, that is a matter for the owner to settle, not the manufacturer, who obviously did his part of the job well - and then some!